Peregrine falcons catch their prey by diving from enormous heights and reaching speeds faster than any other animal on the planet. While this hunting technique is fascinating to watch – unless you’re the prey – it begs the question: why do peregrine falcons chose to enact such risky behavior, and endure significant physical and cognitive demands, to catch their prey? New research published in PLOS Computational Biology uses computer simulations to explore this incredible hunting display. In prior research, this team of scientists from University of Groningen, Netherlands and Oxford University, UK attached video cameras and GPS trackers on Peregrine falcons to show that these birds attack their prey using similar steering rules to man-made missiles. For their new study, the researchers built a physics-based computer simulation of bird flight that pits falcons against their prey, further analyzing the falcons’ dive strategies. The simulation consists of the aerodynamics of bird flight, how birds flap and tuck their wings, how falcons perceive their prey, and how they react to prey with delay and target it like a missile. 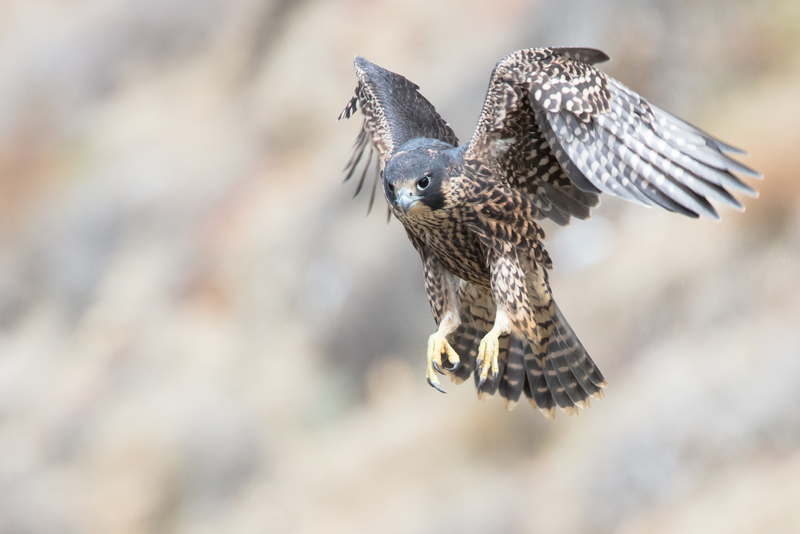 Through running this simulation millions of times, and changing the falcon’s attack strategy each time, the team found that high-speed dives allow the birds to produce much higher aerodynamic forces for maneuvering, which maximizes their changes of capturing fast-moving prey. But the simulation also showed that these high-speed dives require precisely tuned steering in order for the falcon to come away with its prize. The results showed that optimal tuning of mathematical laws that control steering in the simulation corresponded with the measurements of steering for real, non-simulated falcons. With these new findings, the study’s authors will now be extending their simulation to explore the unique attack strategies of other raptor species – including the goshawk and sparrow hawk. This research may help determine why different raptors usually specialize on different types of prey. Their research also includes studying the best escape tactics that prey can use to avoid capture – something you may want to look into if you find yourself pursued by a raptor.